Yes, I know that's April Fools Day, butI want to start on the first of the month to easily keep track of what day I'm on. I may, however, decide to start on the 31st since it is a Sunday. April 1 would be great since it's a Monday, and April has 30 days! I like to use these calendars to keep track of my days: https://whole30.com/bonus-whole30-graphics/ (scroll to the bottom and you'll see a color and grayscale calendar) since I've rarely started a round on the 1st day of the month. Let us know if you have any questions! Hi Pam! I'm starting on April 1st as well! Looking forward to an amazing month ahead! I'm thinking about starting a W30 or a W60 on April 1, too. I had a great December W30, but I'm still working on Food Freedom, and I find that the accountability and support here helps me get back on track. W30 Newbie starting April 1st... *que ominous music - duh, duh, duuuuuuuh! * I'm excited, and to be honest, a little unsure if I can be successful since my immediate family will not be participating. Looking forward to joining a great group for feedback and encouragement. Hi there!! My husband and I are also starting on April 1st! It will be awesome! I’m starting April 1 as well! How can we create an April 1 group? So I’m going to embark upon another whole 30 on Monday April fools day. Hey @LadyLisbette it is good to see you hear and glad to be doing this with you I didn’t make it work the last time but I will this time. It looks like we have a great group here and I love that is starts in April fools. 1. My repetitive injury’s in my neck, shoulders, elbows, wrists and hands are in pain and because of theses I also get numbness in my hands. 2. I have injured my right knee and it isn’t healing quickly. Because I have been favoring the knee my left knee is now angry. Also I need my arms to get off the floor more because of the knees and that is caused the shoulders to hurt. 3. I am completely addicted to sugar of all kinds. I am not discriminatory. I don’t do alcohol anymore so that is great. 4. I did an allergy test about a month back and it created a massive rash. I find that my skin is much more itchy. And then my other allergies seem to be worse. I almost wish I didn’t do the allergy test at all. 5. I want and need a better sleep. 6. I have high blood pressure and my high cholesterol. The last time I did this I was able to get off my blood pressure medicine. I know getting off these foods will help. These are my challenging situations. Breakfast, I always treat myself to a magazine and fast food with a Diet Coke. I’ll need to start eating at home. Fast food is my other challenge. I am very addicted to it and do it every day. The next will be the kids events that are starting up again this month. There I serve pizza desserts and juices. One of my downfalls has been accidentally looking my fingers when I get tomato sauce or chocolate on them. It’s amazing how often you don’t realize you do that until you can’t do it. And lastly my weekend job, they have lots of yummy desserts and foods that they put out towards the end of the day for us all to eat. So I will need to stay clear of that area or just walk by am not look. It’s time to get real. It’s time to stop this madness and get rid of the sugar dragon. Glad to see so many starting with me. Good luck to you. To us newbies, I found out the hard way that a lot of mixed nuts are made with peanut oil - ugh! I will have to buy individual bags and make my own. I started easing myself into Whole30 about 2 weeks ago by mostly eating compliant foods. I am gluten intolerant so I don't have to worry about the baked goods, but chocolate looked to be my food to be missed as I normally have a couple of milk and dark chocolate miniatures at lunchtime. I hadn't been eating them recently so I thought I would have my last few before I start on Monday. Oh, my, they tasted horrible! This is good news for me. I look forward to seeing us newbies succeed! Hugs all around and just remember, we got this! W30 Newbie starting April 1st... *que ominous music - duh, duh, duuuuuuuh! * I'm excited, and to be honest, a little unsure if I can be successful since my immediate family will not be participating﻿. Looking forward to joining a great group for feedback and encouragement. Don't you worry about them. My boss dud her W30 on her own and she has a hubby and 2 girls. She watched them eat all kinds of non-W30 foods that she cooked for them, and eve picked up fast food and pizza. She was very successful. She is going to start another round with me on Monday. So remember, don't sell yourself short. You got this! Starting whole 30 for the second time on April 1st. Haven't used the forum yet. What do I need to do? @PattyBAlbert welcome. We are all here to help support each other. I post how I did for that day, some concerns I may have, what I eat, etc. I like to post my food here instead of the food log because I know the moderators will be able to help if I am doing something I shouldn’t. Here’s a link that will tell you more about it. https://whole30.com/step-two-support/ I hope this helps. Also a Whole30 newbie starting on April 1st! Nervous and excited! How are all of your preps going? 1. Stay compliant/no cheats. Do it one day/min at a time. Thats it I need to keep it really simple. What goals you guys doing for those that didn’t mention it? I need to go over and revamp my if/then scenarios. Have a great day 0!! Hi All! I decided to start April 1st too. Glad so many are also. It is my birthday month and I want to make it a great one! Best to be organized, prep food like Elizabeth33. I forgot how to do include names? I am ready, will be setting alarm clock early. Have to bring treat for someones bday, but planned already how to get out of it and just have some fruit. Tx for the welcome, @Elizabeth33. This is my first attempt so I'm mostly hoping I don't inadvertently break some rules! I wish all of you starting tomorrow the best of luck! You can do it! Hello everyone!! I am starting the Whole 30 on April1 I this is my first time. I am excited and hopeful. Starting a second round of Whole30 today, April1st. I am looking to calm down an upset stomach/digestive system and be healthier. I did a Whole30 two years ago and felt great. Looking forward to feeling great again. I'm new to the forum but this will be my third Whole30 reset. I plan to start on April 1st and glad I've found some other people who are starting around the same time as I am. I've tried starting my Whole30 round 3 for a while now and I get about two weeks in and want chocolate or margaritas. Ugh!...My weakness! I've started to use the Whole30 Day by Day guide and it mentioned connecting with the Whole30 community to find support. I'm doing this on my own and it's tough! My fiancé is as supportive as he can be but he isn't following the reset with me. So I'm looking for like-minded people with my same struggles. Looking forward to connecting with you guys! I HATE MORNINGS... I need that deep impactful and vibrant rest that Clean Eating provides. I like waking up ready for the day before the alarm clock when I'm W30. Nowadays I am late every day and yelling at my daughter because she's moving slow when ultimately its my laziness that created the entire morning situation. My gut is disgusting! I had surgery for fibroids back in Aug 2018 and I thought I'd be getting my body back in shape! Needless to say, I am now just droopy in my mid section and I need to rid the fat there then begin my full workout regiment. Problem with beginning the workouts is that I HAVE NO ENERGY. The Sugar Dragon and Salt Demon are my LATE NIGHT FRIENDS! I have recently enjoyed their company before bed... TERRIBLE I know... I need to slay their asses into itty bitty bite size piece and put them out with the garbage. I am tired of being slave to cravings. My back hurts when I'm sleeping... to the point of me knowing that its hurting because I am carrying too much weight in my gut... I feel that the weight of that while sleeping puts undue stress on my back and causes me to wake up in TERRIBLE pain. I like who I am when I'm on W30... I'm clear headed and fog free! I'm sure yall can imagine where I am today. I've never fully completed the reintroduction period so I'm intending to fully get through. Good luck W30ers! Happy April Fools Day to all!!! I am new to W30 and have started this morning! I received all of my materials/books yesterday from Amazon. I have found so many delicious recipes and will be hitting the grocery store/TJ's today to stock up. I am anxious to hear/find any recipes, tips, suggestions, etc. that I can incorporate. I am here to offer support and in return, need all of the support/motivation I can get!!! Is there a certain way to join a "Group" for this? Thanks! 2. increased energy, mental clarity and positive self-image. We all have our "extenuating circumstances" because life happens, but there's a lot I can reign in, too. I like the idea of taking control and having more power over my health, appearance, and life in general. I want my current days to be the "good old days" 20 years from now. My weekend of prep went well: menu plan, shopping, "before pics" (ew,) and I've added an Aqua Fitness class 3 days/week to my routine. I don't feel like I know what I'm doing, but I do have a solid grasp of what to avoid putting in my mouth. I just have to figure out the mechanics of my daily routine and walk it out... awkward... it's still a lot of information bouncing around in my processor. Another cup of black coffee maybe? *lol* Day 1: We have begun! Good morning or afternoon/evening depending on your time zone to day 1. Welcome all the new people who decided to join us. Today is a big win for me. I usually talk myself out of starting on day 1 but didn’t today. I got everything prepared for food today, had a great breakfast and in my rush left my lunch and snack in the fridge. Thankfully I was able to find some things at a small cafe I can eat. I will have to cut the seasoning off the chicken since it has things I can’t have (garlic, onions, peppers, tomatoes). My breakfast was three scrambled eggs with time, roasted potatoes, artichoke with melted ghee with tea. 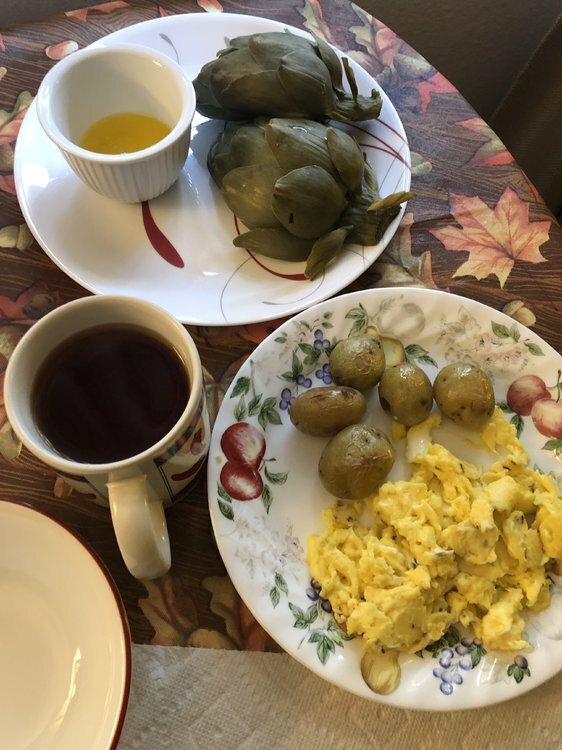 I couldn’t eat everything so I have two little potatoes and 1/2 artichoke left.